Iced Guinatan Halo Halo with Mochi Pearls ~ I Can Do That! I saw these cute mochi pearls from Yummy online magazine as topping for ice cream or frozen yogurt. I made half a recipe, divided it into 4 portions and added pink, teal, yellow, and chocolate food dye. Instead of ice cream, I blended coconut milk and sugar with ice cubes and added some of the usual guinatan halo-halo ingredients, candied sweet potato, saba banana, and jackfruit and topped the iced guinatan with the mochi pearls. It's so delicious. Again thanks Yummy for a great dessert idea. Mix together 1½ cups glutinous rice flour and salt; set aside. Place water, sugar, and corn syrup in a saucepan and bring to a boil. Lower heat and continue to simmer for 4 minutes. Pour the sugar syrup gradually into the rice flour and stir until a sticky dough is formed. Immediately turn dough onto a work surface dusted with glutinous rice flour and knead until smooth and elastic. Add more of the rice flour to prevent sticking. Sprinkle desired flavoring and knead into the dough. Knead in food dye if desired. Roll dough into long thin ropes, about quarter-inch in diameter, and with a sharp knife or scissors, cut ropes into ½ inch pieces. Sift glutinous rice flour over them and toss to coat each piece. Place mochi pearls in an airtight container. Store in freezer until ready to use. Place on top of ice cream, frozen yogurt, or iced guinatan. oooh, that looks delicious! 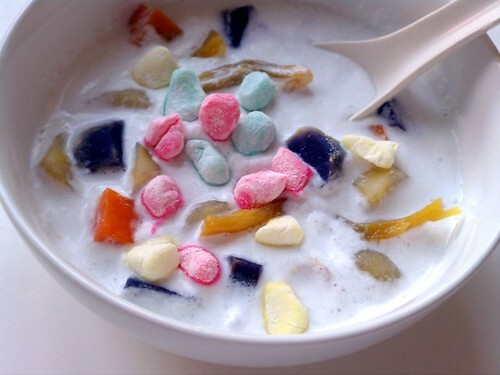 i have tried mochi in frozen yoghurt and loved it...i just know i'd love this creation, too! thanks for the idea! first time here...love your space Oggi..
can this be used for mochi ice cream?